We can estimate the radius of a nucleus by firing an alpha particle directly at the nucleus. The alpha particle will lose kinetic energy as it approaches the nucleus and gain potential energy due to the electric field because of the electrostatic repulsion between the positively charged nucleus and the positively charged alpha particle. We can then work out the closest distance of approach of the alpha particle to the nucleus. We can achieve a better estimate of the size of a nucleus by looking at the angle qm to the first minimum when electrons are diffracted by a foil target. where l is the wavelength of the electrons. 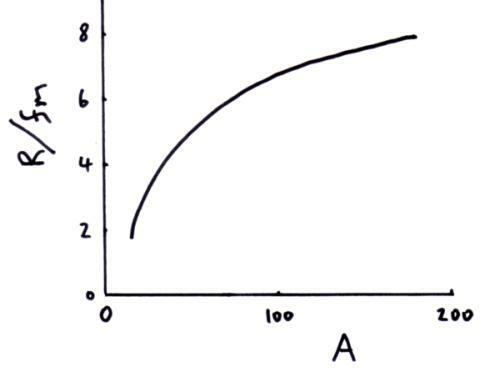 From experimental data the equation below has been derived. By assuming the nucleus to be a sphere we can calculate the density of the nucleus.